I’ve said it before and I’ll say it again. 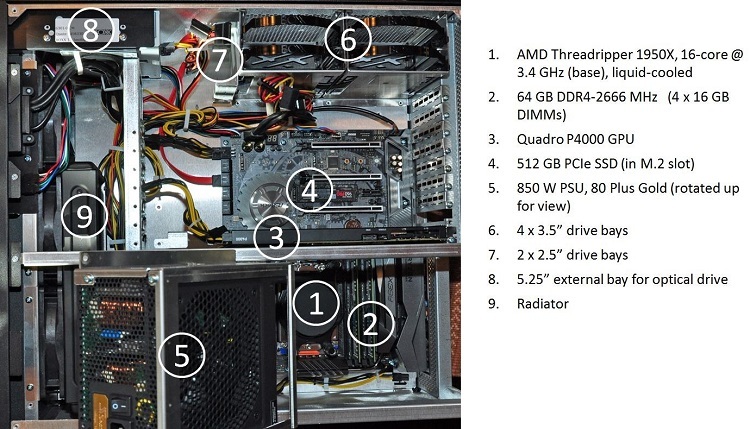 Reviewing a workstation from Boxx is a delight. No knock against the big box vendors who do sensible and innovative jobs in creating and building workstations. But the workstation volume-leading trio of HP, Dell and Lenovo face different constraints and priorities than does Boxx, and the latter is free to be significantly more aggressive in pushing the envelope on workstation product design, components and configurations. The company sent us a pair of its latest workstations — the Apexx S3 and Apexx 4 model 6301, and as usual, there was no confusing these machines with what you’d find among the offerings of the high-volume suppliers. Boxx has put together a lengthy and successful track record in the workstation industry by specifically not following the market leaders with me-too products. Rather, the company has developed a strong identity on the back of differentiated performance focused and application focused machines. It intentionally doesn't compete on the same footing as HP, Dell or Lenovo, because it knows it can't compete in their playing field, one focused primarily on price and price-performance. On the flip side, by making very conscious design decisions in its workstation products, it also knows that HP, Dell and Lenovo can't compete in its corners of the market either — ones that value top-end performance and will sacrifice reasonably higher prices to get it. So if you’re a buyer that focuses primarily on price you're more likely to head to one of the big three. Justifiably so. But if you need to push performance a bit beyond where comparable models from the big three can reach, yet you’re not made of money and still care about getting good value for your dollar, well then you're sitting directly in Boxx’s crosshairs. Taking a look at both the specifications and construction of both these Boxx machines, it’s apparent the company has again done what it does best. From the outside, the Apexx S3 doesn't look a whole lot different than what you’d find from other quality suppliers, but its design touches stand out, starting with a sturdy industrial enclosure without an ounce of molded plastic — nothing but steel and alloy here. 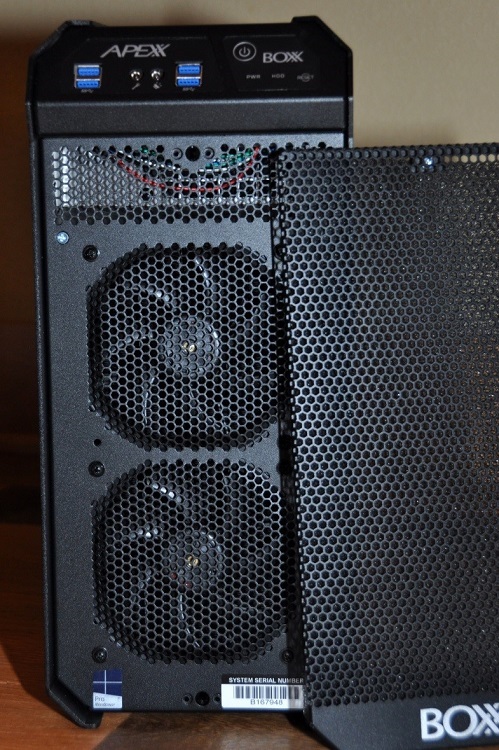 Its front grill houses an easily releasable and cleanable dust filter, a feature that honestly should be on every workstation, given that accumulating dust is among the top contributor to eventual hardware failure. Still, where a Boxx workstation may not look all that unique on the outside, opening up the chassis always reveals something you won’t find in a top-tier workstation. Getting inside the chassis is easy — just a couple thumbscrews to release the side panel. 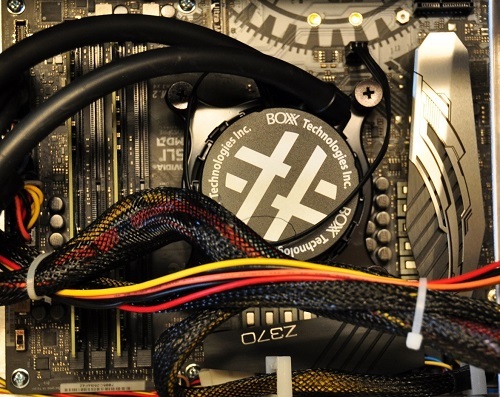 Once inside, we immediately find one of Boxx’s most common differentiators in a liquid-cooled, overclocked CPU, a design feature that’s become Boxx’s calling card among workstation vendors. Boxx left the Core i7-8700K’s nominal frequency of 3.7 GHz in the dust, driving the clock all the way up to 4.8 GHz (base, not turbo) and delivering up to a 37% performance boost. Paired with the liquid cooling tower and pipes is of course the radiator, equipped with two fans and running nearly the length of the chassis front. While the Core i7-8700K integrates an Intel UHD Graphics 630 GPU, surely not many, if any, Boxx customers will rely on it. Rather, most or all will choose to populate one of the three x16 PCIe slots (two of which are x8 or x4 electrical) with one of the many Nvidia Quadro (up to the 24 GB P6000) and AMD Radeon Pro cards (up to the 16 GB WX 9100). Ours came sensibly configured with a single high-end Quadro P4000, a nice complement to the rest of the selected components. Again, pushing premium features, Boxx chose the ASRock Taichi Z370 Coffee Lake motherboard, allowing for overclocking and up to 64 GB (4 x 16 GB DIMMs) of 2667 MHz DDR4 memory. The Taichi Z370 also makes easy work of what was once a luxurious upgrade but is now a checkmark item, at least in a premium-class workstation product: SSD storage. Where that SSD was once sitting in a drive bay over a slow SATA interface, it’s now sitting on PCI Express, supported by NVMe protocols to deliver the fastest, lowest-latency access. Better yet, modern motherboards provide that physical interface on small M.2 slots, freeing up the conventional full length PCI Express slots. The Z370 Taichi raises the bar providing not the one or two M.2 slots but three, with one filled in our case with the 512 GB Intel 960 Pro card that constituted all of our system’s storage. It’s worth noting that the M.2 slots share PCIe lanes with SATA I/O, such that using the M.2’s will disable SATA interfaces — not a surprising tradeoff or a big deal, but worth noting. With the single boot drive in the M.2 slot, our configuration left the conventional drive bays (along the chassis ceiling) unoccupied, but I imagine most users would want to add a big SATA HDD or SSD for data storage or backup, leaving the OS on the M.2 SSD. The two 3.5” drive bays can each be split to accommodate four 2.5” drives (2.5” options SSD only). Going with the former can populate a total of 16 TB of HDD, while the latter route could fill a maximum of 16 TB of substantially more expensive SSD. It’s worth noting that with the smaller volume to work with, Boxx designers chose to forgo support of a 5.25” external bay, meaning those requiring an optical drive will need to access via a USB drive. Personally, that’s a don’t care for me, as external drives are dirt cheap and rarely needed any more (particularly in a commercial environment), but potential buyers should be aware. Delivering the power to drive all these components is a modular 80 Plus Gold efficient, 650 W Seasonic G-Series power supply unit (PSU), mounted over the CPU but easily rotated and slid out of the way. The high-quality PSU complements the machine nicely, but keep in mind the 650 W limit (typical for a 1S model this size) may constrain your choices in GPUs. Yes, the three full-length PCIe slots can support three Nvidia Quadro or AMD Radeon Pro GPUs, but the more cards you populate, the lower wattage those cards must be. Clearly, a 650 W total budget isn’t going to be able to support two 250 W+ Quadro P6000 GPUs, let alone three. With the standard 650 W supply, the Apexx S3 can populate one Quadro P6000 or P5000, two of the more modest-wattage Quadro P4000s and a max of three 75 W P2000s (or lower end cards). The PCIe slot connectors are cased in steel, a nice touch for a workstation that touts reliability, especially one that may often house a big dual-slot card that might otherwise bend and flex a plastic connector. As I’d expected from Boxx and its choice of motherboard, the Apexx S3’s connectivity doesn’t disappoint. The front panel sports the usual mic-in, audio-out mini-jacks along with four USB 3.1 ports. The back offers a bit more than you might expect, including 7.1 audio with an optical S/PDIF output as well. In addition, USB is plentiful on the rear panel as well with another four USB 3.0 ports and two USB 3.1 ports. One of the 3.1 ports is available in the newer Type C standard. You’ll also find a DisplayPort and HDMI video interfaces driven by the Core i7 CPU, though again, they’re unlikely to be used in favor of the discrete PCIe GPU. Though USB has long taken over dominance as a mouse/keyboard interface, the PS/2 port can still be a nice-to-have feature for big workstation buyers that have closets filled with old mice and keyboards. The integrated Intel 802.11ac WiFi and Bluetooth 4.2 is a unique feature for a workstation, but it comes with the Z370 Taichi. While WiFi is not a critical feature in a workstation, which will typically be connected via wired GigE (two ports available), the on-board radio can’t hurt, and Bluetooth is always nice, even if just for ergonomics (e.g. wireless headsets). While Boxx’s take on a Coffee Lake-based workstation is no yawner — its overclocking makes it quite possibly the fastest single-threaded processor available — the bigger news in this review is Boxx’s choice of CPU in the Apexx 4 model 6301: AMD’s Threadripper CPU. Why so notable? It culminates years of expectations and prognostications (by this author, especially) as to when AMD would make a return as a credible vendor of CPUs for the workstation market. Because while AMD has been a consistent and reliable supplier of professional GPUs over the years — in the form of FireGL, FirePro and now Radeon Pro brand GPUs — its history in workstation CPUs has been anything but. But a few years ago, we started hearing about Zen, a new x86 architecture not coincidentally spearheaded by Jim Keller, the same technical force behind Hammer of a decade prior. The Zen architecture looked credible in its goal to bring AMD CPUs back to a competitive position in performance-oriented markets. In particular, Zen promised to dramatically boost single-thread performance by 40%, and making sure to catch up in floating-point throughput, something Hammer’s successors like Bulldozer compromised on. Ever since the first Zen disclosures, I’ve been left wondering and writing about when AMD might use it to make a serious assault on the workstation market again. Well, that time is now, as Zen products bearing a few different brands — Ryzen 7, Ryzen Threadripper, Ryzen Pro, and Epyc — are all positioned to potentially begin taking back workstation CPU share, from entry-level single-socket (1S) all the way up to max-configured dual-socket (2S) monsters. On the dominant deskbound side of the market, AMD’s Zen-based lines now serve all four of the de facto standard product tiers: Entry 1S, Premium 1S, Entry 2S and Premium 2S. The first of those CPUs to start making some workstation noise is Threadripper, adopted by several vendors including Puget Systems, Velocity Micro, NextComputing, Maingear, and of course Boxx, showcased in the Apexx 4 model 6301 and fitting into the Premium 1S category. Essentially two 8-core Ryzen 7-type die in a single multi-chip package (with intra-package interconnect a la its Epyc siblings), Threadripper populates up to 16 cores, beyond what the vast majority of OEMs typically present as options in single-socket workstations. Today, Premium 1S machines like HP’s Z440 and Dell’s Precision 5820 offer Xeon W CPU options that top out at 10 cores, while in general more modest core counts dominate workstation CPU sales — quad-core being the dominant configuration, by far. Still, there will always be pockets of the market that will buy as many cores as they can afford, and in those pockets Threadripper should certainly entice. 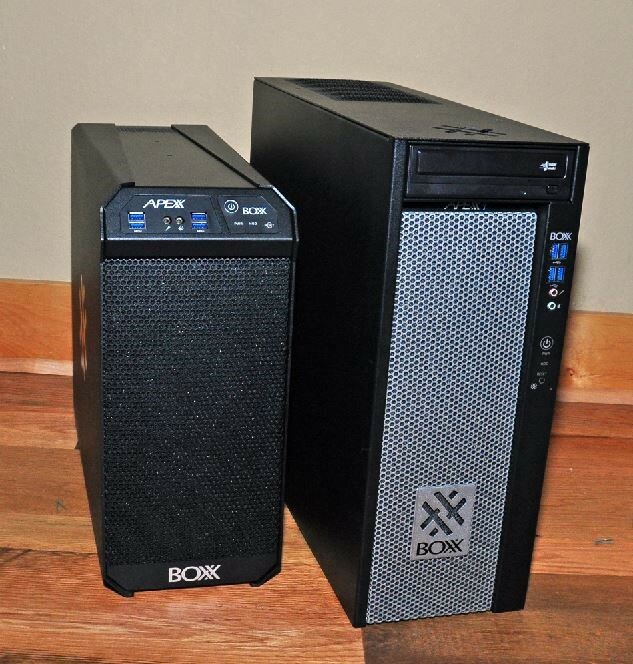 The Apexx 4 6301 comes in a larger, more conventionally sized tower than the S3, with Boxx’s more established Apexx look and feel, and as always solid and free of molded plastic. The similarities with the S3 are more noticeable once we get inside the chassis, as the machines share much in the way of layout and motherboards. Specifically, the Apexx 4 6301 is built around a very comparable ASRock Taichi motherboard, this one sensibly named the X399 Taichi (after AMD’s Threadripper-supporting X399 chipset). Boxx offers both the AMD’s 16-core Threadripper 1950X (in our build) and also the 12-core 1920X. Like the S3, the Apexx 4 6301 provides liquid cooling for the CPU, but unlike the S3, the CPU is not overclocked. Rather, the 1950X runs at AMD’s nominal 3.4 GHz (base, not turbo). So why liquid cool but not overclock? It could be for several reasons, including improving reliability, easing airflow requirements, and — just perhaps — paving the way for an overclocked version in the future. Boxx complemented the 1950X with 64 GB of 4-channel DDR4-2666 memory, organized as four 16 GB DIMMs (we halved the capacity but not bandwidth in benchmarks ahead), For storage, we outfitted the machine with 512 GB Samsung 960 Pro NVMe SSD in of the Taichi’s three M.2 slots (all of which are directly-connected to the Threadripper CPU for minimum latency). The X399’s additional lanes allow for a fourth PCIe x16 mechanical slot the S3 doesn’t support (though if populating all four, two are driven with 8 lanes electrically). The larger chassis allowed Boxx to configure more drive bays — four 3.5” and two 2.5” — along with a 5.25” external bay to house the optical drive the S3 lacks. The Apexx 4 6301’s I/O matches that of the S3 in the front and manages to throw in four more USB 3.1 ports in the rear. Driving it all is the Apexx 4 6301’s 850 W 80 Plus Gold PSU, which is mounted over the CPU and rotates out of the way in the same way the S3’s PSU does. The extra watts should allow the 6301 to support more GPU horsepower, for example, two Quadro P6000s/P5000s, three Quadro P4000s, or four Quadro P2000s (and lower wattage SKUs). As with the S3, the Apexx 4 chassis and internals are burly, clean and organized, but not particularly set up for simple, tool-less access. For example, to prep the system for testing, I swapped out a dual-slot GPU card to put the Quadro P4000 in its place. Because of the dual-slot thickness, getting at the retention tab (to press and release the card from the connector) only works from the backside of the card. But the problem was, the backside was so tight up against the PSU bulkhead, there was no way to get a finger in to reach the retention tab from any angle. Instead I had to unscrew the frame to the PSU and rotate the frame of the way in order to reach the tab. Ditto when I went to remove a memory DIMM, which required not only moving the PSU out of the way but removing the GPU, which now was in the way of one of the DIMM retention tabs. Not a reliability or functional issue but still, the access — a result more of Asus’s choice on slot locations for the Z370 motherboard — could be better thought out. For most individual buyers or users, ease of service is not going to be a critical purchase criterion, rather ranking somewhere between a don’t care and a minor nicety. (Though it’s important to differentiate ease of service with the ability to service, as lacking the latter would be a showstopper for most workstation buyers.) If I was not a reviewer but a user taking delivery of the machine, I’d never have had to service the machine in this way, and even spending some extra time to do it once or twice shouldn’t really be a reason to shy away from a workstation that otherwise perfectly fits the bill. But it may very well mean more to an IT administrator given the task of configuring (on site, if needed) and maintaining a gang of workstations. 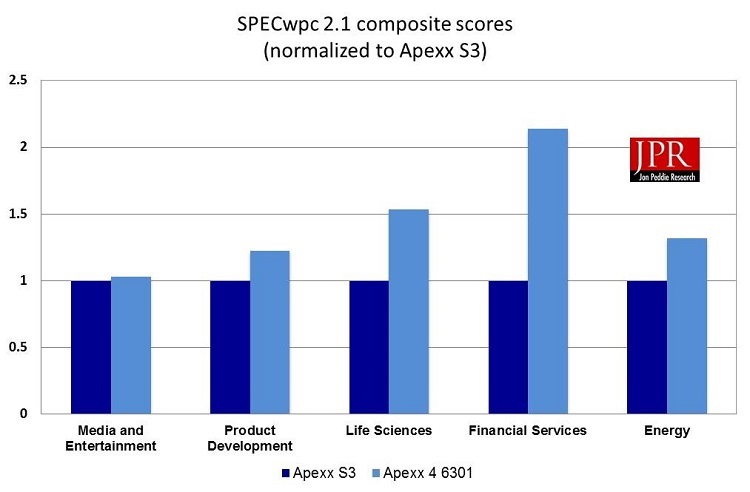 To gauge performance levels of both the Apexx 1 and Apexx 2, we employed the latest 2.1 version of SPEC's workstation-focused benchmark, SPECwpc. While no benchmark is perfect, SPECwpc does the best job I’ve seen of stressing all workstation components in a "whole system" environment that users experience. It’s both broad and deep, and aggregates sub-tests into workload groups representative of the most common workstation verticals: Media and Entertainment, Product Development, Life Sciences, Financial Services, Energy and General Operations. It even contains the same viewsets that its graphics-focused sister test, Viewperf, uses to measure 3D graphics performance. 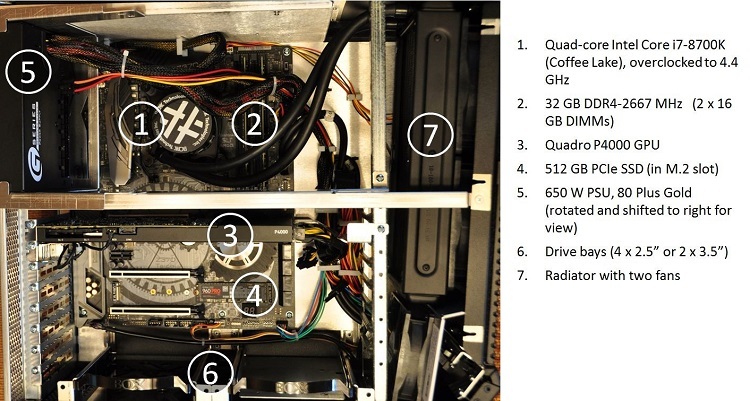 To provide a comparison of how much a high-performance single-socket Boxx workstation has advanced from generation to generation, I’ve also thrown in a previous set of benchmarks from a Boxx Apexx 4 circa Q1’16. At almost two years old — at the front end of the typical 2-3 year refresh cycle of most professionals — we can get an idea of the productivity return an investment in a new, similarly priced machine can get you today. Keep in mind, however, that the difference in OS (Win 7 Pro to Win 10 Pro) could also have a minor impact on results. I ran the previous SPECwpc 2.0 version to compare today’s S3 with the Q1’16 Apexx 4. And I used the current SPECwpc 2.1 version on both the Apexx S3 and Apexx 4 6301 to create an equal playing field. Note that the SPECwpc 2.1 results do not include the General Operations test group, as one component (Octave) for some reason would not run successfully on the Apexx 4 6301. At first glance (and by intent), we’ve got the possibility to do some valid, head-to-head and apples-to-apples comparisons between the Apexx S3 and Apexx 4 6301, and in particular between the Coffee Lake Core i7 and Ryzen Threadripper CPUs. And that’s largely true, as the rest of the critical system components are very similar, if not identical. Both machines are configured with the same 512 GB NVMe SSD on M.2 PCIe. And I intentionally configured the same Quadro P4000 GPU in both machines. Lastly, the memory is identical in terms of footprint, type and clocking speed: 32 GB, DDR4 and 2667 MHz. It’s worth noting that Threadripper has more on-chip cache and supports four memory channels to the Core i7’s two. However, since those are CPU design choices, any performance differences due to memory sensitivity can still be attributed to the CPU and not the OEM’s system or memory configuration. Still, despite the nearly identical configuration of the systems, in another important respect, we’re still talking apples and oranges comparing these two new Boxx models. Specifically, the two CPUs themselves represent two very different — yet equally valid — implementations, optimized for different types of workloads. On one hand, we’ve got a Core i7 with a mainstream number of cores (6, though 4 is even more mainstream) running at a bleeding-edge frequency, and on the other hand we’ve got a Threadripper running at mainstream frequency but populating a bleeding-edge number of cores. Accordingly, going into testing, I’d expected to see the former perform notably better on single-to-few threaded workloads and the latter perform substantially better on more heavily-threaded processing. The degree of those disparities would likely be the more interesting discovery in testing. That’s OK, and doesn’t mean one is better than the other, but rather that the two CPUs are equipped to operate better on different types of workloads. It’s like comparing a diesel engine that delivers huge torque at low RPM with a sports car engine that drives RPM high in order to achieve its horsepower: two different tools optimized for different applications. It’s also worth emphasizing here that the faster core versus more cores decision is a true engineering tradeoff, all else equal. That means the more you have of one, the less you’ll tend to have of the other. Ultimately, chip thermal, power and electrical constraints will limit designers to how much they can push on one or the other design points. Populate a few cores and it’s far easier to drive the frequency up, but start piling on cores and (again, all else being equal) the frequency will need to come down. And in recent years, both the top frequencies and the rate of fall-off as core counts rise hasn’t changed a lot. 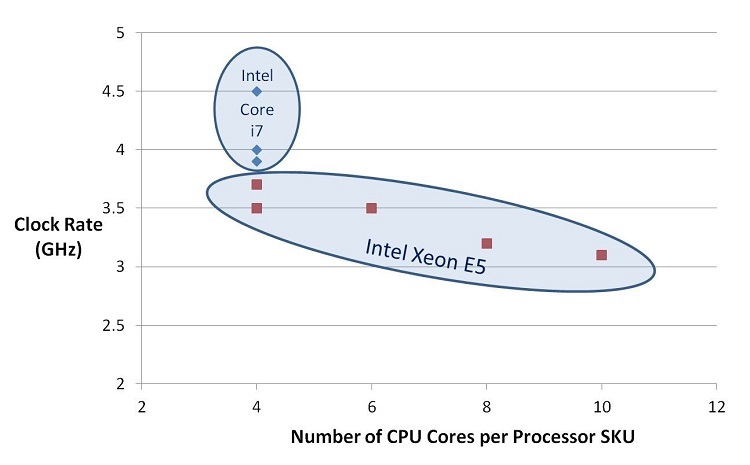 Check out the chart below, comparing some lower-core count Core SKUs from 2015 against higher-core count Xeon SKUs. And remember, the laws of physics impose the tradeoff, which therefore is generally independent of vendor and brand. Where a vendor may choose to strike the balance may vary, of course, specifically Intel with Xeon and Core or AMD with Ryzen, Threadripper and Epyc. 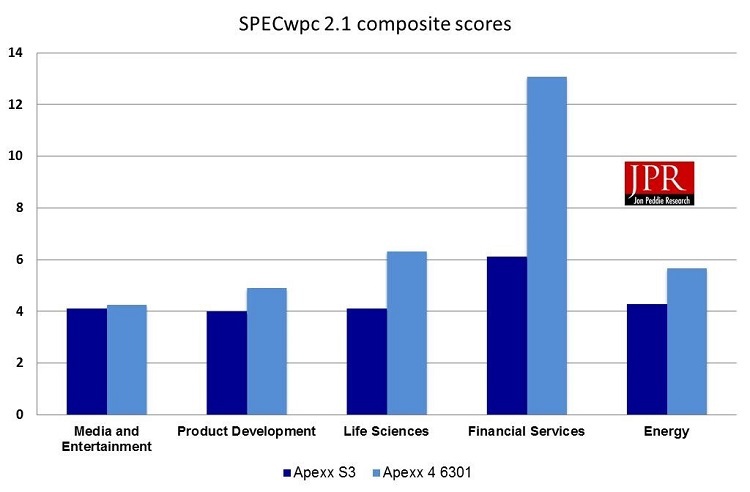 First up, let’s take a look at the SPECwpc composite scores for the two systems, both in the context of raw scores and when normalized to the Apexx S3 scores. Looking at the normalized view, we find the Threadripper Apexx 4 bests the Apexx S3 across the board on composite scores by an average of 45%, though the degree of its advantage varies widely by test group. So we’re done, then? The Apexx 4 6301 is the better workstation and the Threadripper the better workstation CPU? Well, no doubt Threadripper is looking good. But a “one is better and the other worse” conclusion is premature, because we’re just getting started with the analysis. First off, we need to consider that the Apexx 4 6301 (and its Threadripper CPU) is more expensive. So digging one layer deeper, we can look at composite scores per dollar, normalized to the Apexx S3 results. Now, we’ve got a mixed bag, one that leans in favor of the Apexx S3/Coffee Lake for Media and Entertainment, leans in favor the Apexx 4 6301/Threadripper for Life Sciences and Energy and is pretty much a wash for Product Development. If we take into account that Media and Entertainment and Product Development verticals represent much larger markets than the other three, both machines and CPUs are looking impressive. focus, SPECwpc contains a breadth of test cases, including a majority of single-thread workloads but also several multi-thread cases, including both 8-thread and 32-thread. The Financial Services test group is by far the most heavily-threaded of all the groups in SPECwpc — all are 32-thread — making it the ideal showcase for the 16-core Threadripper to shine. And that leads to what I find the most illuminating exercise in this review: to compare the relative merits of the Apexx S3’s few-core, high-frequency Core i7 with the Apexx 4 6301’s many-core, modest-frequency Threadripper. Instead of looking at composite scores grouped by vertical market, we can instead group individual test by thread count and chart the scores (and scores per dollar) of the Apexx 4 6301 normalized to that of the Apexx S3. Now, the relative strengths of the two CPUs stand out, as well as how much bang for the buck each delivers as a function of thread count. The 4.8 GHz 6-core Core i7 consistently provides better performance per dollar on single-thread tests, while the 3.4 GHz 16-core Threadripper leaves the Core i7 in the dust on 32-thread workloads. And the middle ground of 8-thread workloads are — as one might expect — a mixed bag, though the under-core’d Core i7 lags more than it leads. The spread in performance at each thread count can likely be attributed to differences in microarchitecture, for example the aforementioned differences in cache size and memory access. Note that Threadripper manages to edge out the much faster clocked Core i7 on one test case (actually two, if I look at raw scores, independent of price), illustrating how clock rate alone isn’t always the deciding factor for even single-thread performance. A fast clock doesn’t help if a CPU’s processing elements are idle from lack of data. Despite all the extra watts being consumed in the pursuit of overclocked performance, the Apexx S3 was not conspicuously noisy under nominal loading. Under heavy load (portions of SPECwpc), however, fan speeds kicked up significantly, driving perceptible noise up significantly, from a more typical 47.2 db to around 50.7 db (approximating distance from under desk to ears). That’s a level I’d imagine most anyone would find annoying, were it to last for significant periods. Given the worst-case loading necessary to crank up those fans (a very multi-threaded test with SPECwpc), however, in all likelihood that noise will be the exception far more than the rule for the majority of users. And of course, it’s a natural tradeoff imposed by the more challenging thermodynamics associated with the screaming fast CPU, hence a tradeoff S3 buyers will more than likely accept in exchange for the increased throughput. The Apexx 4 with Threadripper also got a little loud under heavy loading (same portions of SPECwpc), but on the order of 49.2 db peak, quieter than the S3. That makes sense as the S3 has to push cfm probably on the order of the Apexx 4 but through a significantly smaller volume, leading to both higher fan speed and air turbulence. 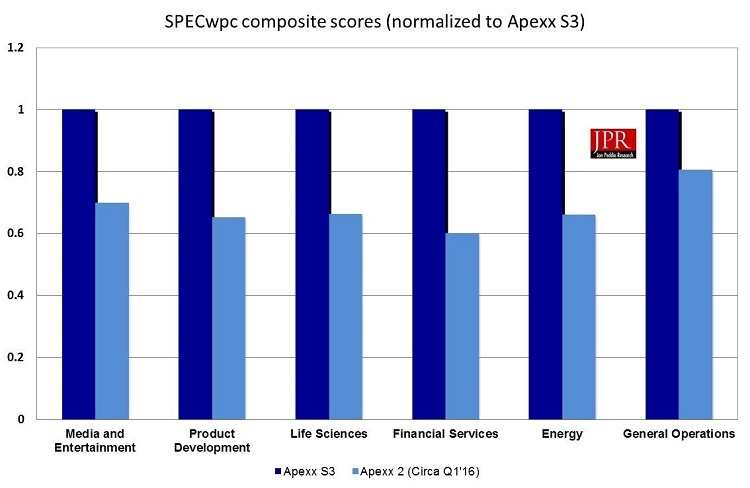 To get an idea of what investing in a new Boxx workstation to replace a 2 year old (and at the time very high performance) Boxx model, we can compare the Apexx S3’s scores with that of the Apexx 2 of Q1’16. 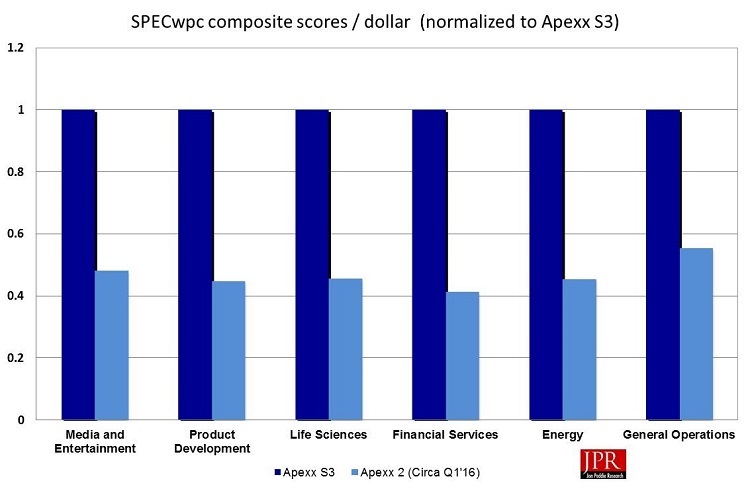 Results show that not only does the Apexx S3’s performance stand out to that of its peers today, it represents a dramatic step forward in throughput over time, especially with respect to how much a dollar spent can return. 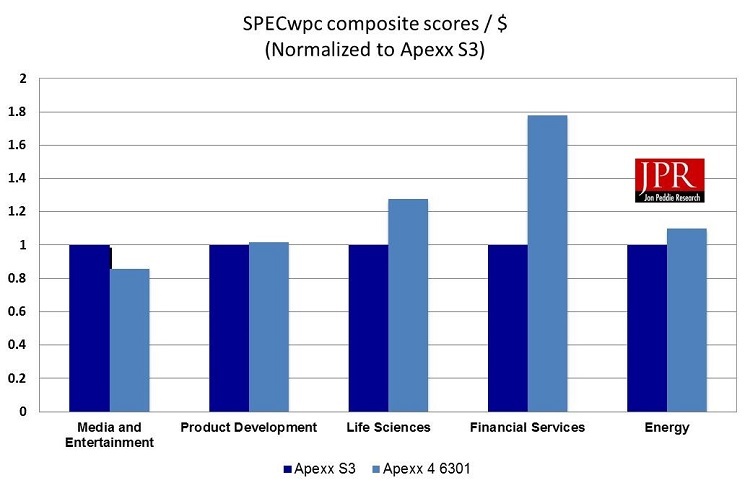 On average, today’s Apexx S3 delivers about 50% higher SPECwpc scores and a full 2X the scores per dollar as the Q1’16 Apexx 2. It’s hard to imagine a more compelling statement on the value of maintaining a reasonable workstation replacement cycle than that. With these two machines, Boxx again pursues ways to deliver performance for professional applications in ways other vendors can't, or choose not to. In the case of these two machines, those ways are primarily via CPUs that HP, Lenovo and Dell don’t have in their arsenals. And in the end, the proposition Boxx presents yet again is straightforward. Neither Boxx machine is intended for a buyer who chooses based solely on price. But true to its identity, Boxx again is delivering workstations at reasonable, mid-range price points that win on performance, making them compelling choices to consider when your productivity depends on getting the best throughput for visually-intensive and compute-intensive professional applications. 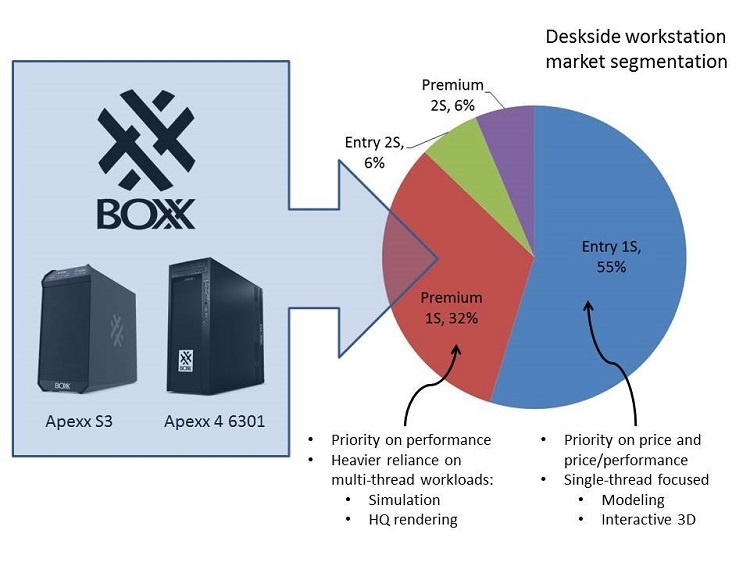 But more than just separating itself from the big box vendors, Boxx this time is delivering two workstation products that are separate from each other as well, each is shaped to serve different needs among its performance-focused Premium 1S customer base. With this review, we're faced directly with a dichotomy in processors— two different CPUs adept at different workload types. From the perspective of pushing single thread performance at a moderate price, the S3’s liquid cooled overclocked Intel Core i7 can't be beat, especially with respect to performance per dollar. 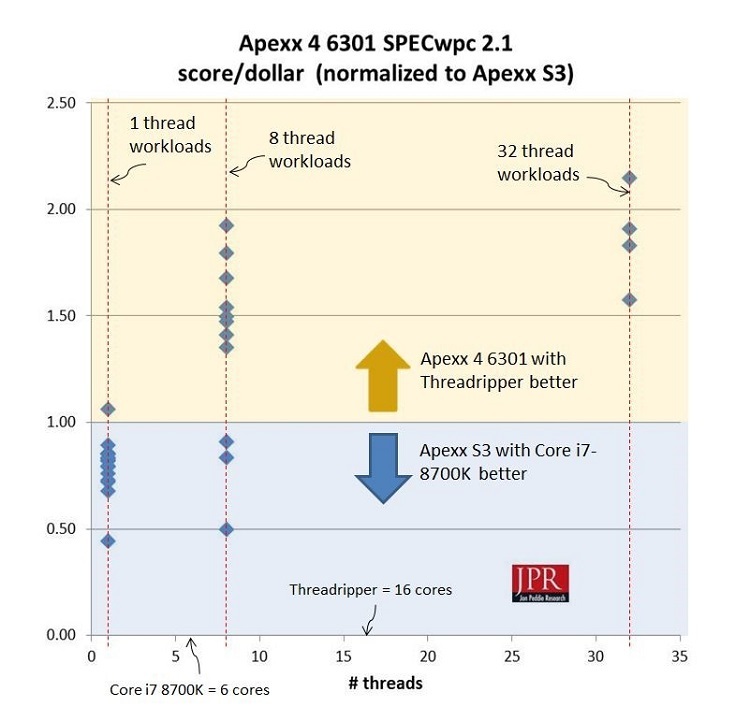 On the other end of the workload spectrum stressing heavily threaded computing, Apexx 4 6301’s Threadripper makes for a compelling value proposition for users that demand and can exploit more massively parallel computing resources in a single socket platform. Let’s stop for a moment to consider the CPU landscape in workstations, because it may not be what you might first imagine. It’s tempting to assume that CPUs with 16 or more cores would be a perfect fit for workstations, given that the platform places such a premium on performance. Well that's absolutely true in parts of the market, but it ultimately depends on the specific usage and workloads. Specifically, it depends on whether the applications you care most about — the ones you use the most and impact your productivity the most—thread effectively across a lot of cores. Or whether they are they still mostly sensitive to single thread throughput (that in the same microarchitecture will scale largely by frequency/GHz). Perhaps counter-intuitively, many-core’d CPUs actually represent the exception, not the rule in the workstation market. 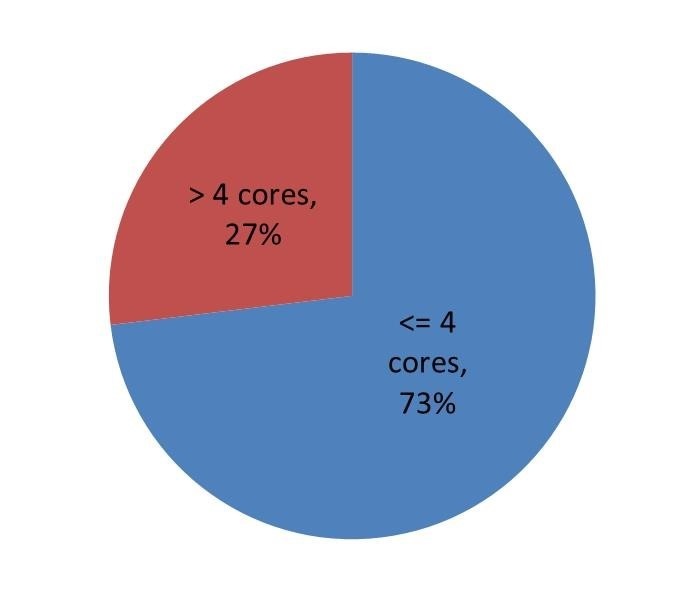 Despite over a decade into the era of multi-core CPUs, the truth remains that for many users, the applications most customers rely on still depend on single or few-thread execution the bulk of the time. The bottom line is that pushing beyond 4 to 6 cores holds diminishing returns for the mainstream majority of mainstream workstation professionals. Evidence of that is clear in the workstation tracking I do for Jon Peddie Research, which shows that currently a full three quarters of deskside workstations ship with CPUs of four or fewer cores (with quad-core by far dominant), and the percentage is higher for mobiles models. Virtually the entire Entry 1S segment of the deskside marketplace — representing over 50% of deskside volume — ships with quad-core CPUs. However, with this exercise, with these machines, and with this vendor, we’re not concentrating on serving the lowest-cost, highest-volume Entry 1S segment. While it’s certainly not trying to plumb the outer reaches of the lunatic fringe of users, Boxx is also not primarily interested in the mainstream either — again, that’s where HP, Lenovo and Dell play. No, Boxx’s eyes are focused in the upper half of the market, served by Premium 1S workstations and 2S workstations, where the company’s focus on performance and unique products stand out and demand buyers’ attention. And specifically it’s that Premium 1S segment — representing a third of deskside shipments — where both the company’s traditional penchant for max-performance overclocked Intel Core i7 CPUs and this new marriage of Boxx and AMD Threadripper make so much sense. Premium 1S workstation buyers will typically see more in the way of multi-threaded workloads, have a stronger desire to make them run faster, and be more willing to pay a reasonable price premium to get there. As SPECwpc results demonstrated, and confirming expectations, Threadripper’s 16 cores quite sensibly outperformed the Core i7-8700K at higher thread counts — and the more numerous the threads in use, the bigger its edge. Boxx offers Xeon SKUs with up to 22 cores in its 2S workstations, and now it has a 16-core CPU to serve the Premium 1S segment. Rather than competing with the Apexx S3 and Core i7-8700K, a workstation and CPU like the Apexx 4 and Threadripper provide a complementary weapon in Boxx’s arsenal, allowing the company to best serve the breadth of workloads more common in the upper half of the workstation market spectrum. Intel can no longer claim blanket superiority over AMD in workstation-caliber CPUs — and that’s a tremendous accomplishment for the #2 vendor. After (literally) years of anticipation, we have finally gotten to see Zen CPU technology driving a workstation, and the results meet expectations. Testing clearly shows Threadripper can excel at highly-threaded, professional-caliber workloads, and in single-thread performance, it doesn’t lag much behind the highest-GHz CPU Intel and Boxx can support. How much share AMD can take from Intel in workstation CPUs remains to be seen, but AMD is just about guaranteed a foothold. A few Zen-based workstations have emerged, as smaller vendors like Puget Systems, Maingear, Boxx, and Velocity have introduced workstations based primarily on Threadripper, with a secondary interest in Ryzen. Bringing on board early-adopting vendors like these represent a valuable stepping stone for AMD to build momentum for Zen, and we imagine Boxx must be happy that the adopters of Ryzen/Threadripper are small in number today. But ultimately those aren’t the OEMs AMD is eventually after. To make serious headway in the marketplace, AMD would need to push beyond footholds and gain traction at Dell, HP and/or Lenovo, the trio responsible for more than 80% of the workstation unit volume. Signing on any of those three, however, is a different game, as those market-dominating vendors have very important fundamental differences in goals and operating principles. Nimble vendors like Boxx can search out market opportunities generation to generation, even if that may not sustain momentum long term. To gain that edge, they’re willing to take on some level of risk about the competitive longevity of both the supplier and its products. By contrast, taking a risk and having faith aren’t what Tier 1 vendors like HP, Dell, and Lenovo are interested in; they prefer a sure thing. While all three place importance on competitive specifications, maximum performance is not a goal that overrides all others. A high-volume supplier needs the confidence that a supplier like AMD will have products that are competitive not for just one or two workstation product cycles, but for many years and cycles to come. 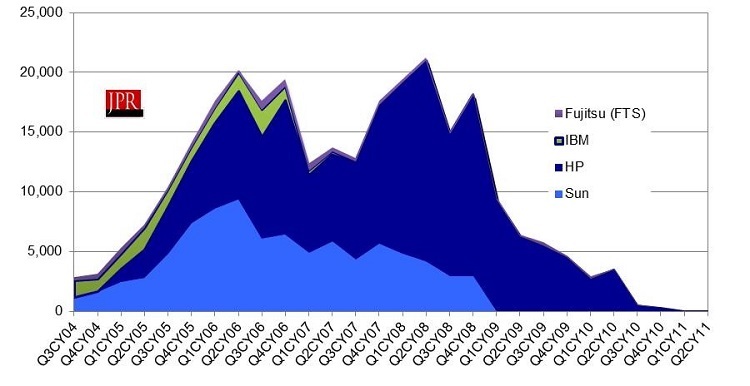 OEMs Dell and HP will likely remember quite well that up-then-all-the-way-down chart of Opteron of the mid-‘00s, and that’s a memory that won’t help lock up sockets for Zen. Furthermore, while a CPU like Threadripper is a capable and worthy fit for the Premium 1S segment of the deskside, to entice a broad-based Tier 1 vendor AMD may need to prove its lower core count Ryzen and/or Ryzen Pro can compete in the high-volume Entry 1S segment as well. Otherwise, it’s not clear whether a big OEM would be willing to make the investment and commitment to bring on a new supplier (which AMD would be in the context of CPUs) to serve a minority of its overall served market. So yes, Zen-generation CPUs, including Threadripper, will let AMD compete again in workstations, and that’s welcome news for everyone in the industry, with Intel the obvious exception. But that achievement represents the ante, not necessarily the winning hand. To succeed, AMD must convince OEMs they will be able to compete not for just one generation or one segment, but for the long term and across the market spectrum. Do that, and workstation buyers will find a more vibrant competitive market for the workstations they need, and we’ll be talking about AMD as a formidable vendor of workstation-caliber CPUs for years to come. Don’t, and the history of Zen CPUs in workstations is more likely to replay that of Opteron’s a decade ago.